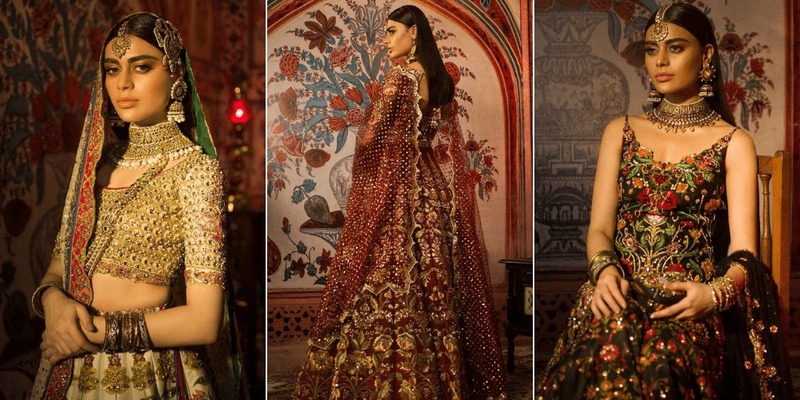 Nomi Ansari’s Latest Bridal Dresses Are What You Expected & More! Nomi Ansari has long been known for his flair for concocting a dramatic display of colors that somehow always turn up nicely. His new bridal dress collection is no different. 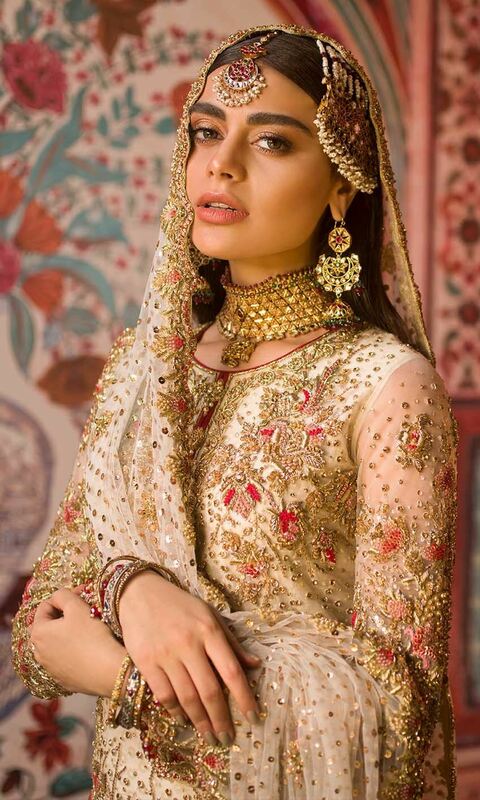 Take a look at the six bridal articles he launched recently. All of them will be perfect for a Mehendi, Mayun or Shendi function. 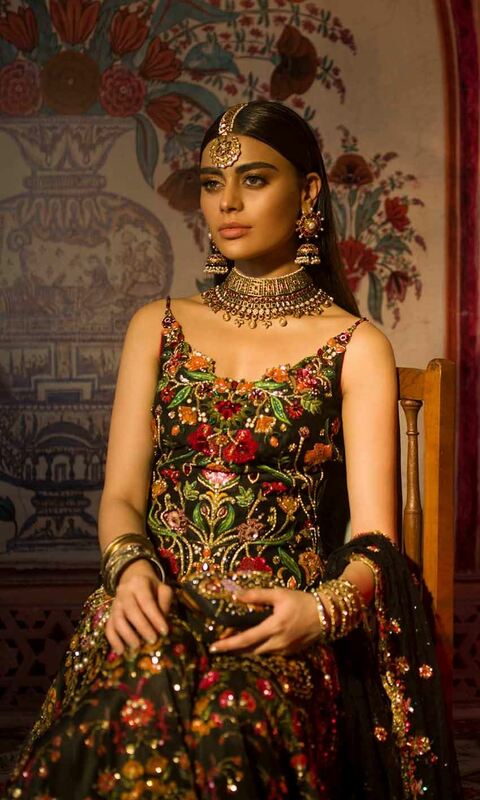 An embroidered, crystallized, custom tailored zardozi choli paired with a printed lehenga. The white base of the dress proves to be a great foundation for colors to play well. 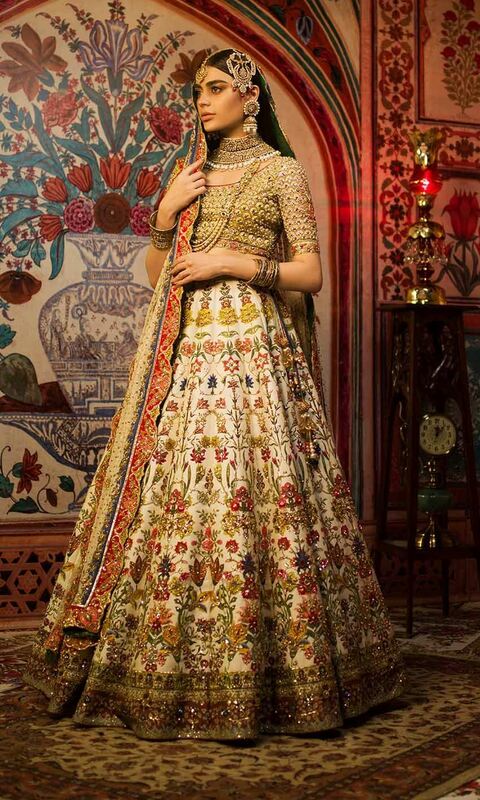 The lehenga comes with a chiffon dupatta with applique border. The golden zardozi work is appealing in its impact. Overall, this dress is a pretty amazing option for you to consider. 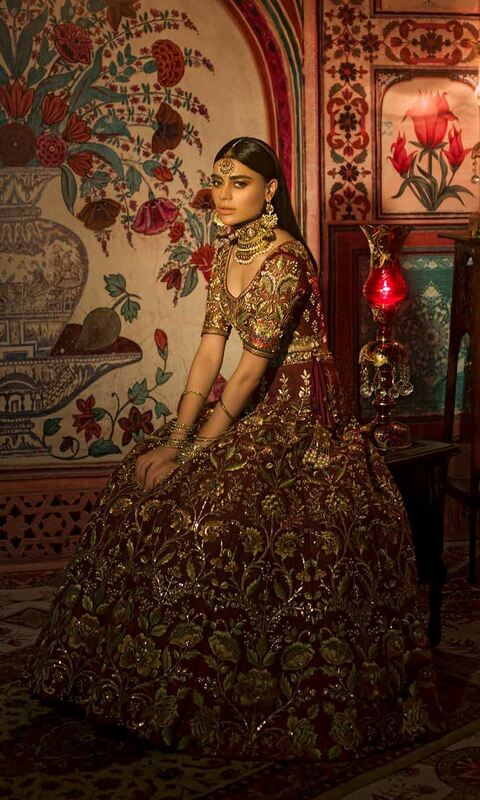 This here is Nomi Ansari’s signature deep maroon zardozi jeweled lehenga. 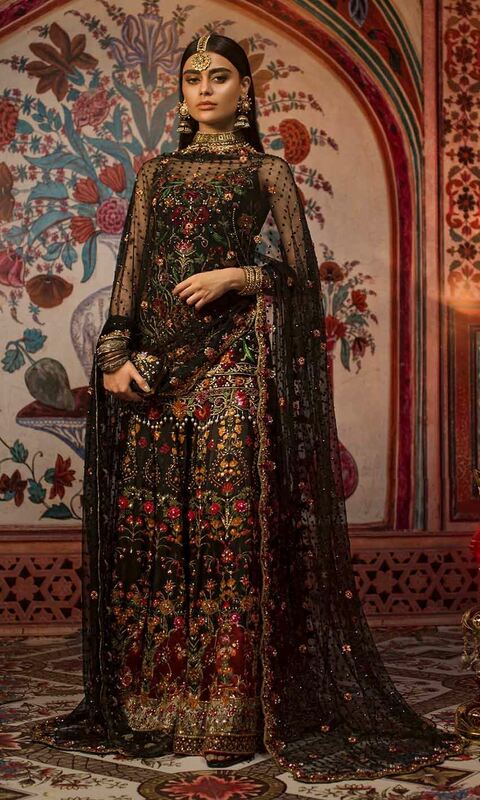 It comes with with a heavy embellished choli and is paired with a heavy tulle net scallop dupatta. A perfect red, contemporary bridal dress for brides to be who prefer a more spread out, a sweeping dress that will not require much accessorizing. This is another white article with colorful beading and cutwork that’s stunningly detailed. 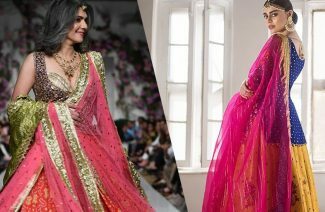 The lehenga flows into greens, pink, purple and blues that somehow look very well balanced, with its sweeping white base, and rainbow color effect. This black diamond strappy jeweled short shirt with heavy zardozi, details in Swarovski crystals is another Nomi Ansari classic creation. The thread and beads paired with embellished printed satin Dhaka pants and tulle net dupatta with a scalloped border all around it. It is the lust-worthy bride’s maid outfit you need to get. 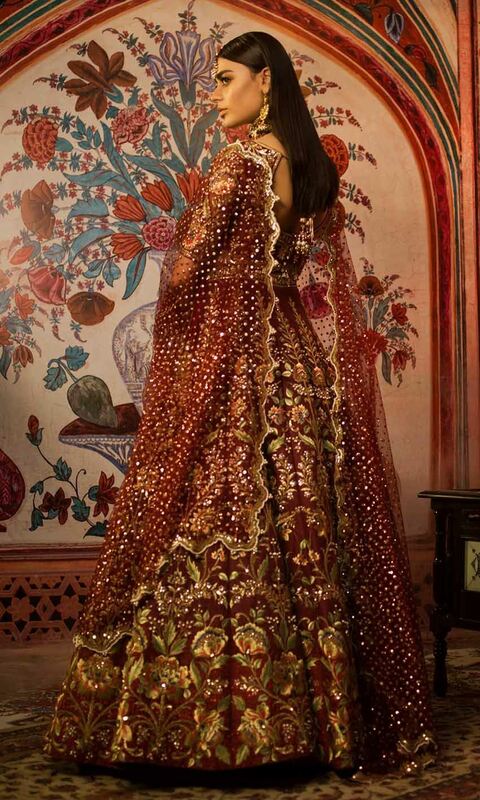 This is an old-school silhouette lehenga choli, with a long shirt. 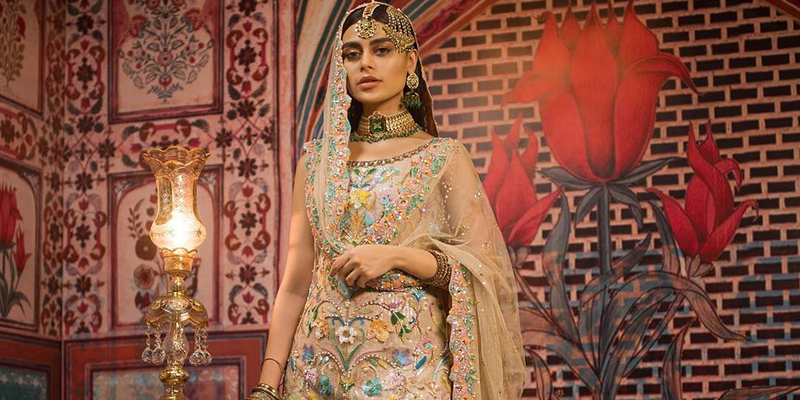 The outfit is covered in pretty printed and embroidered florals and zardozi work. It also comes with a tulle net dupatta with a scalloped border all around it. Get these Nomi Ansari’s signature Dhaka pants with a strappy shirt. 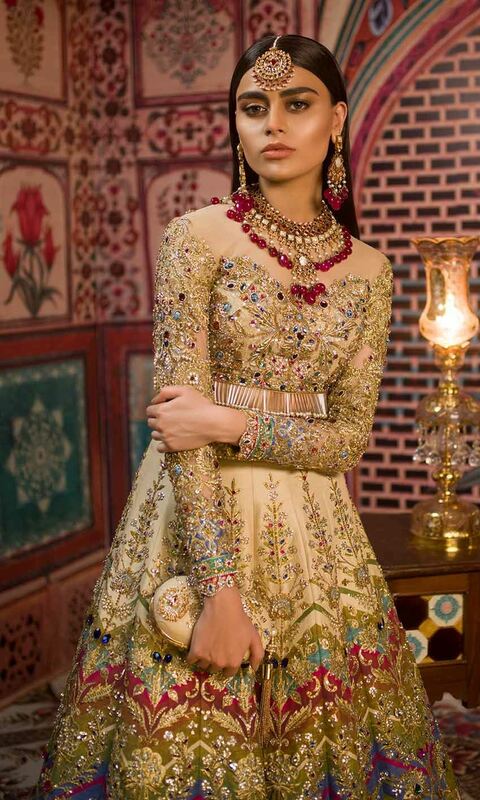 It is paired with a tulle net heavily embroidered dupatta with aari and zardozi bling work. The pastel silhouette for the coming season is a perfect blend of royalty and heritage. Aren’t they something brilliant? We sure think so. 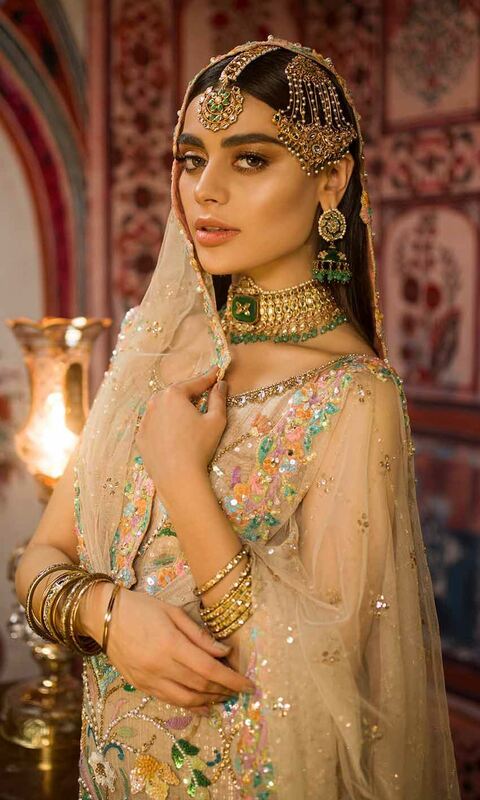 Nomi Ansari knows just how to manipulate the colors for a festive formal and bridal look that somehow manages to look innocent, despite all the heavy embroideries. Nomi Ansari is a visual artist, with his dresses as canvases!